Pull back the floor trim and remove front floor spacer (LH) for access to floor panel. Check that the clutch pedal height (H1) from the floor panel (1) is within the reference value. Replace clutch pedal if the height is outside the reference value. Check that the clearance (C) between the thread end of clutch interlock switch (1) and stopper rubber (2) is within the specification range while clutch pedal is fully depressed. Clearance (C) : Refer to CL-20, "Clutch Pedal". 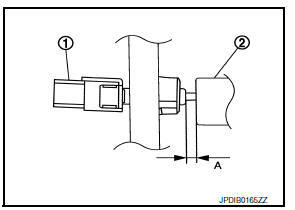 Position of Clutch Pedal Position Switch (if equipped) Check that the clearance (A) between the thread end of clutch pedal position switch (1) and clutch pedal (2) is within the specification range while clutch pedal is fully released. 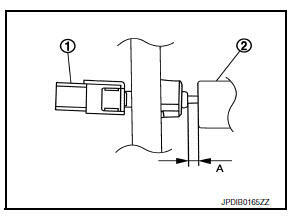 Clearance (A) : Refer to CL-20, "Clutch Pedal". Disconnect the harness connector from the clutch interlock switch. Rotate the clutch interlock switch (1) 45 degrees counterclockwise to release from bracket. With the clutch pedal fully depressed, insert the clutch interlock switch (1) until it contacts the stopper rubber (2). Rotate the clutch interlock switch 45 degrees clockwise to set clearance (A) between the clutch interlock switch (1) and stopper rubber (2). The clearance (C) must be within the specification range. Fully depressed clutch pedal means a clutch pedal condition that the clutch pedal lever contacts the pedal stopper rubber. Disconnect the harness connector from the clutch pedal position switch. Rotate the clutch pedal position switch 45 degrees counterclockwise to release from bracket. Insert the clutch pedal position switch (1) until it contacts the clutch pedal (2). Rotate the clutch pedal position switch 45 degrees clockwise to set clearance (A) between the clutch pedal position switch (1) and clutch pedal (2).